Repair information software is perhaps the most important software tool in your automotive repair shop. Professional vehicle repair information software can save you time diagnosing and repairing, give you insights from other expert technicians, and help make your vehicle repair process run more smoothly. Mitchell 1 provides premium automotive repair information for professional auto repair businesses. Since we started in 1918, we have evolved from producing the industry-defining Mitchell Manuals, to developing comprehensive auto repair information software for professional technicians. As technology advanced, and our database of auto repair data grew, we transitioned to digital solutions to make accessing and searching through all of that data faster and simpler. Today, our ProDemand software stands at the forefront of the auto repair information industry. 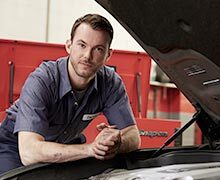 Stay on the cutting edge of vehicle repair information with ProDemand, featuring more than 30 million pages’ worth of auto repair data, plus real-world insights from professional technicians. Our database grows every day to give you even more updated expert repair information based on actual auto fixes from all across the country. We designed ProDemand to help you work more efficiently, with user-friendly ways to access that information and save time diagnosing, estimating and repairing vehicles. Every aspect of our software is designed to make your job easier, so you can save you time and work with confidence, knowing you have complete and accurate information to help you get the job done right. ProDemand’s intuitive features, including SureTrack Real Fixes and the Top 10 Repairs List, make it easy for you to find the information you need for the vehicle repair that you are working on. You can retrieve OEM and real-world repair information in a single lookup for most any vehicle. Our best-in-class wiring diagrams are displayed in a consistent style across vehicle makes so that you can easily read diagrams for every vehicle that comes in to your shop. As technology evolves, so does Mitchell 1. We’ve been providing leading automotive repair information since the Ford Model T was still in production. Through the years, we’ve consistently grown to implement new technologies to help auto repair technicians maximize efficiency, including optimizing ProDemand to work on tablet devices. ProDemand Mobile gives you access to all of the repair information that you need right at the vehicle. On the commercial truck side of the industry, we’ve applied our technical expertise to develop TruckSeries – the first and only comprehensive repair information software system for Class 4-8 trucks. TruckSeries is the definitive all makes truck repair information software, delivering access to all of the industry-leading repair information that you need, for every stage of the repair, all within a single application. Complete OEM repair information and exclusive expert-based knowledge in a single lookup. Complete service information for all makes of Class 4-8 trucks, conveniently bundled in a single application.